Australian Toby Price continued to stun the Dakar world by taking victory in the penultimate stage of the Dakar to consolidate his third position in the overall standings. The 2015 event is Price’s first ever Dakar making his performance even more astounding. 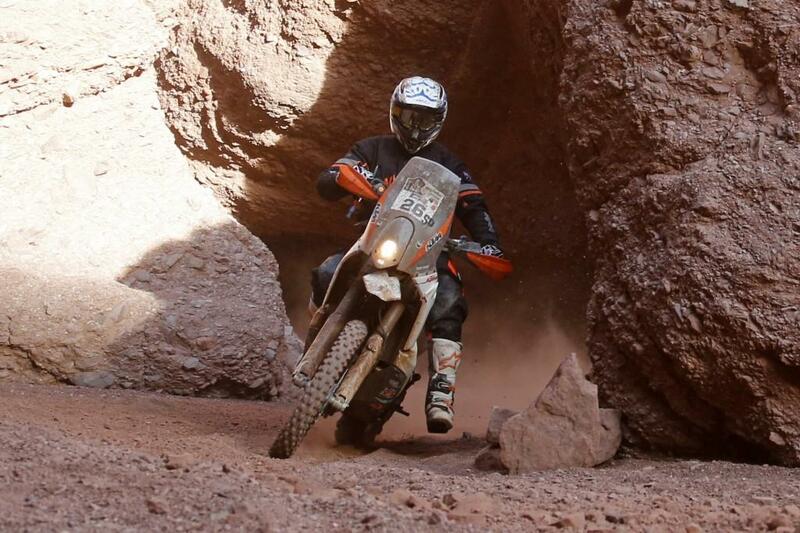 The KTM supported rider won the stage by 1m 55s from fast Spaniard and former race leader Joan Barreda. Price said: “It's my first go at the Dakar, but like we say, we've still got one day to go. Anything could happen and at this stage everything is just feeling good. We're enjoying it, so it's been a good experience. There have been a lot of highs and lows and good learning curves as well as a few mistakes, but we're trying to fix them as best we can and get to the finishing line. Hopefully, that will happen tomorrow. I always knew it was going to be difficult, but you don't know until you actually come here and have a go and then you actually find out how really hard it is. We were fairly well prepared coming into the event. We're just going to come back next year hopefully, now that we know what we're in for and be an even bit better prepared again”. Race leader Marc Coma consolidated his overall advantage and goes in to tomorrow’s final stage with a commanding 17m 49s advantage over his closest rival Paulo Goncalves. Goncalves’ hopes of challengiung Coma for Dakar victory effectively ended on stage 11 when he had to swap the engine on his HRC machine. Changing an engine earns the rider a 15 minute time penalty, enough of a deficit to give Coma some breathing space. Goncalves said: “The Dakar is not finished. There's still one day of racing left. I'm in 2nd place, but there's no guarantee that I'll remain there. Anything can happen, either positively or negatively. But, effectively, I'm happy for myself and the entire Honda HRC team for the work we have done. Joan Barreda had a strong lead before the stage at the salt lake in Uyuni. He lost his place due to a problem caused by water in the engine. But we'll finish the Dakar on the podium, and that's a very good thing”. Simon and Llewelyn Pavey edged ever closer to fulfilling their dream of completing Dakar together. The father and son pairing claimed 73rd and 74th on the stage meaning that Llewelyn is now 62nd with Simon 63rd. The 13 and final stage will see the remaining 79 competitors leave Rosario and head to the finish line in Buenos Aires. The stage is made up of a 219km liaison and a 174km times special stage.